The third installment in Michael Bay's trilogy travels back to 1969's historic moon landing, when Neil Armstrong and his Apollo 11 cohorts touch down in the Sea of Tranquility ... and discover what appears to be a downed Transformers craft. Flash forward to the present, and the Decepticons are ready to exact revenge on Optimus Prime and the rest of the Autobots. 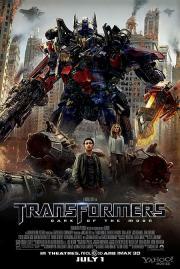 Shia LaBeouf returns as Sam Witwicky, the Autobots' human ally. Third chapter has many of the same problems as its predecessors (overlength, a leery, oafish sense of humor) but benefits from a lighter, breezier tone and what appears to be some self-deprecation sneaking in at the corners (LaBeouf is so abrasively unlikable here it sort of becomes parody!) Malkovich and McDormand are clearly around for their paycheque, but they both inject some style, and the climactic action sequence (while far too much of a good thing) still gets the pulse racing adequately. There's parts of this movie where some terrific actors make absolute fools of themselves and some part of me enjoyed that. The rest is just soul-draining.